Beethoven was no stranger to transcriptions and arrangements. He reworked many of his works himself and authorized others to make transcriptions, many of which bear official Beethoven opus numbers. What may be the only surviving original copy of Czerny’s cello transcription of the Kreutzer Sonata, published by Simrock and probably dating from 1822/23, was discovered listed in an antique music catalogue in 1992 by cellist Dimitry Markevich. 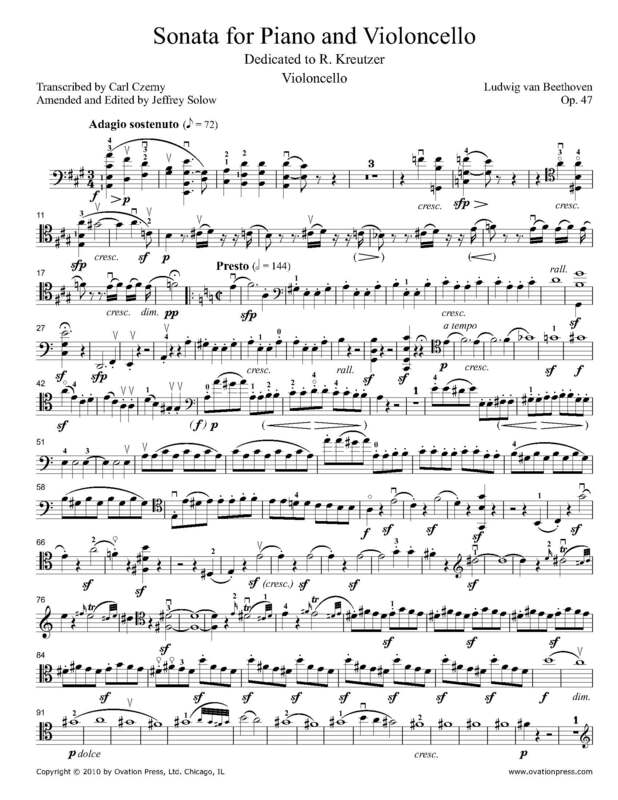 Carl Czerny (1791-1857), Beethoven’s favorite student, had premiered the op.102/2 cello sonata in 1816 with Josef Linke, cellist of Beethoven’s favorite quartet, and it is likely that this transcription was intended for Linke. Beethoven trusted Czerny’s skills both as arranger and interpreter; he knew all of Beethoven’s piano works from memory and had certainly played the Kreutzer many times in Beethoven’s presence. Czerny made three Kreutzer transcriptions—one for two pianos, the cello version (for which the original piano part remains unchanged), and the Variations for solo piano—all probably at Beethoven’s request. A good transcription must exploit the character of its new instrumentation without sounding implausible for the composer to have written it and it must reveal sufficient new aspects of the work to balance the inevitable loss of some original qualities. Since today’s listeners are familiar with the Kreutzer played on the violin, a successful cello rendition cannot depart overly from what they are used to hearing. Cello technique has advanced considerably since Beethoven’s day and I identified many places where Czerny ‘chickened out’ and that I felt would benefit from restoring Beethoven’s original figurations or octave relationships. My version only extends above the range of the cello part in Beethoven’s Triple Concerto in three spots and as Beethoven denotes this sonata as, “Composed in a highly concertante style, almost like a concerto” -- meaning that the two parts are of equal importance and have the brilliance of a concerto.